Biodiesel is a clean burning and renewable diesel replacement that can be manufactured domestically from vegetable oils, animal fats or recycled grease. Biodiesel has many benefits such as it is cheaper to make, lessens dependency on imported oils, and is all around safer. Many labs around the world looking for new blends or different materials to use to get the most yield. In the US alone there are currently 166 power plants spreed across working on producing biodiesel. Compared to petroleum diesel biodiesel causes less damage if spilled or released to the environment  Biodiesel is less combustible, having the flashpoint (the temperature at which a particular organic compound gives off sufficient vapor to ignite the air) for biodiesel higher than 130 degrees Celsius compared to that of petroleum diesel that is 52 degrees Celsius. Biodiesel is safe to handle, store and transport. Biodiesel improves fuel lubricity. Diesel engines depend on lubricity of the fuel to keep moving parts from wearing too soon. Using biodiesel reduces greenhouse gas emissions because carbon dioxide released from biodiesel combustion is offset by the carbon dioxide absorbed while growing the soybeans or other feedstock. Biodiesel is the only alternative fuel to successfully complete the EPA's (Environmental Protection Agency) rigorous emissions and health effects study under the Clean Air Act. Biodiesel reduces emission of carcinogenic compounds by as much as 85% compared with petrodiesel. When crops used to produce biodiesel are grown in the country in which the fuel is consumed, each gallon of biodiesel displaces a gallon of imported crude oil, reducing a country's dependence on foreign oil. 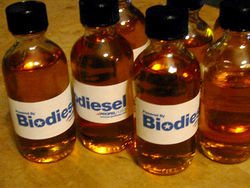 Biodiesel has been proven to be much less toxic then diesel fuel, and is readily biodegradable. These attributes make it less likely to harm the environment if an accidental spill occurred, and far less costly to repair damage and clean up. In both soil and water, biodiesel degraded at a rate 4 times faster then regular diesel fuel, with nearly 80% of the carbon in the fuel being readily converted by soil and water borne organisms in as little as 28 days. Most of the current research taking place right now is mostly about finding more appropriate crops to enhance oil yield .Researchers at UConn have found that the fiber crop Cannabis sativa, known as the industrial hemp, has properties that make it viable and even attractive as a raw material, or feedstock, for producing biodiesel. Sustainable diesel fuel made from renewable plant sources. This plant has the ability to grow in infertile soils also reduces the need to grow it on primary croplands, which then be reserved for growing food. Cannabis stalks are fast growing and require little water, fertilizers, or high grade inputs to flourish. The seed which stores the plants natural oil are often discarded. This is a waste of a product the could be put into good use by turning into fuel. The U.S NREL (National Renewable Energy Laboratory) have been doing research involved with experimenting with algae, having 50% more natural oil content as a biodiesel source. Unlike the crop based biofuels, alga culture does not cause a threat to a decrease in food production as it requires neither farmland or fresh water. Many companies are pursuing algae bio reactors for research. Looking for a guide on How To Make Biodiesel Using A Used Cooking Oil? This suitable short video explains precisely how it's done, and will help you get good at drive green. Enjoy this advice video from the world's most comprehensive library of free factual video content online. ↑ 5.0 5.1 5.2 5.3 5.4 5.5 Biodiesel Benefits and Considerations http://www.afdc.energy.gov/. Web. January 30, 2016. ↑ Pacific Biodiesel. BIODIESEL BENEFITS – WHY USE BIODIESEL? Biodiesel.com. Web. December 30, 2015. ↑ 7.0 7.1 7.2 Current Research on Biodiesel Fuel berkeleybiodiesel.org. Web.accessed January 11, 2016. This page was last modified on 4 February 2016, at 15:37.